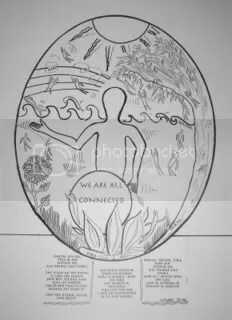 This is a copy of the black and white Elemental Mandala I created for a “remembering we are all connected” workshop (centre). 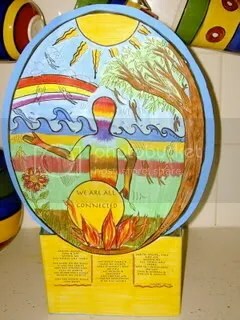 It is coloured in and cut out and mounted to create a 3 dimensional plaque Mandala. I was running an Art of Change training workshop for 12 counsellors representing many footsteps ….All around the room the Earth, Water Fire and Air Mandala was being coloured in…rich warm flames, deep blue seas….as I looked around the tables it was as if a circle of little campfires had emerged and the warmth and connectedness in the room was palpable. A peaceful, playful atmosphere and I was feeling very pleased with how the “Sacred Nature of the work that We Do and Creativity in the Workplace” workshop was going ….very well indeed…. We broke for afternoon tea and upon stepping outside saw a huge puff of billowing smoke over the next hill……the wind was blowing towards us and after a brief period of uncertainty…we were evacuated because of a FIRE heading our way…. Oh the theatre of our Fire Evacuation!…tables full of elemental Mandalas….the Community Connections bus with a flat tyre-that-was-changed-very-quickly…art gear tossed will nilly into pillow cases and car boots….Relaxation and Meditation session tossed out the window! The bush fire water-plane zooming over head…. When creating with Fire…especially on a Full Moon day.. ….do not underestimate the power of the collective energy of a group of people colouring the elemental Spirits into Being…. 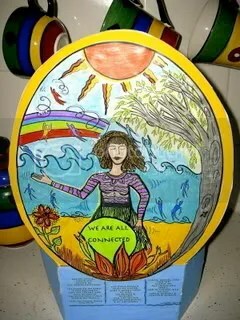 This entry was posted on December 22, 2006 at 10.34	and is filed under Aboriginal, Art, Community, Creativity, Mandalas, The Art of Change, The Law of Attraction. You can follow any responses to this entry through the RSS 2.0 feed. You can leave a response, or trackback from your own site.